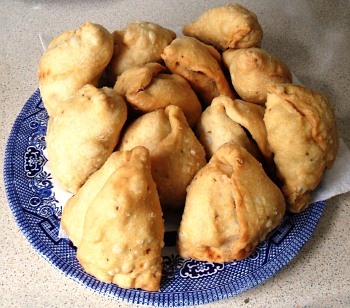 Firstly, the pastry requires a minimum of 20 minutes to rest which will produce perfectly acceptable samosas. However, if you can give it 24 hours in a refrigerator, that is much better. So, if you have the opportunity to give it a day to rest then just start off by making the dough and the following day, continue with the rest of it - processing the potatoes then instead. their skins on and then peal them off afterwards. First, put the potatoes on to boil. I used Cyprus potatoes, washing off the clay and then putting them in a big pan and covering them with boiling water. You should, wherever appropriate, use boiling water from and electric kettle because it is so much more efficient than heating water up from cold in a pan on the cooker. Bring them to the boil and leave them for 20 minutes or so to cook - remembering to check them to see that they are not over-cooking. 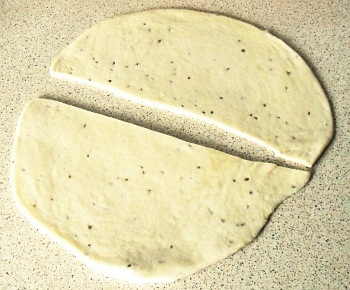 Whilst they are cooking, we are going to make the dough which will also need time to rest. 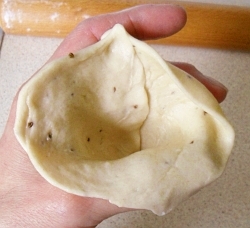 Put the flour and the ajwain seed into a small-/medium-sized bowl and mix. Make a well and add the oil. 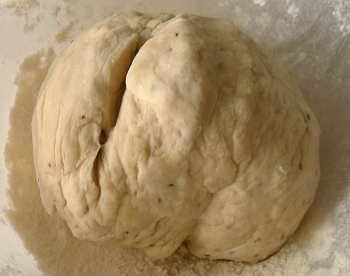 Add around 200 mls of water, adding the last quarter of it a bit at a time as you knead the dough - stopping when you have a stiff dough. Roll the dough into a ball and put it in the bowl, covering with a clean, dry tea towel and put it to one side for 20 minutes. The potatoes should be done by now and when they are, just switch them off. Now, we are going to make the filling. Put the whole coriander into a large pot and heat it up gradually so that it roasts - until it starts to smoke. Remove it from the heat. Tip it into a pestle and crush the seeds with the mortar, stopping whilst they are still fairly coarse. Tip them back into the pan. Add some oil and put it back on the heat and add the garam masala and fry it for a few seconds. substituting spices and veg as you like. Add the chillies and fry them for half a minute, then adding the chopped onion, ginger and garlic. Remove the skins from the potatoes and put in the pan, chopping them up as you fry them so that there are no pieces of potato bigger than around 1.5cm. 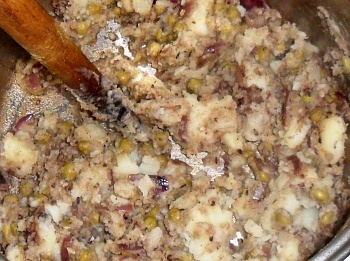 Add the peas and fry until it starts to brown. 2-3mm thick and slice in half. Take a small ball of dough - around 3-4cm in diameter - and put some oil on it - you can do this by very quickly dipping the bottom of it in the cooking oil in the fryer. Put it on the work surface and wet the work surface by moving it around. Turn it over and flatten it down a bit. Make sure that there is oil on your rolling pin and roll out the dough into a circle roughly 15cm in diameter but more importantly, around 2-3mm thick. the straight edge to itself. Slightly wet along the straight edge of one of the pieces with some water. Pick it up and wrap it around to form a cone - sticking the straight edge onto the other end - start at the corners and work inwards. Pinch the tip of the cone to make sure that it is sealed. After a bit of practice, it only takes a few seconds. Hold the cone in your hand as you can see in the photograph. 1.5cm gap around the top. 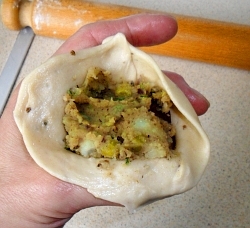 Take some of the filling - which should not be too hot - and put it into the cone, pushing it down into the corner. front wall of the cone. Take hold of the front edge of the cone wall and make a fold in it to form a pleat as you can see in the photograph. 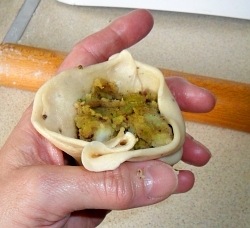 This will give the samosa extra strength once it has cooked and you should be able to stand them up. the filling and press it into the back. Take the pleat and pull it up and over the filling, pressing it into the opposite (back) edge. Pinch the front edge into the back edge, working towards the corners one at a time, forming an arc. When you have finished, what is currently the top will become the base and you should be able to stand it up so that the tip of the cone points upwards. Turn on the deep oil fryer and set the temperature to 170Celsius. for around 10 minutes or so. 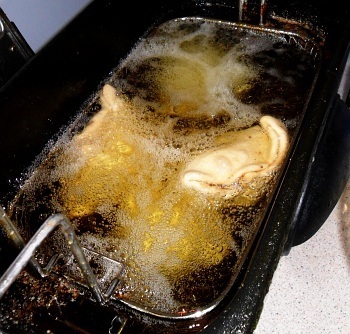 Gently lower the samosas, one at a time, into the oil. They should take around 10 minutes to become crisp and golden brown. If the oil was hotter, the outside of the pastry would be burning before the inside - the pastry that is in contact with the filling - would not have had a chance to cook. Remember that the tips of the corners and the tip of the cone are not cooled by the filling and so will be the first bits to burn. 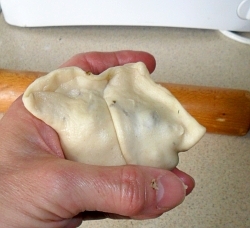 The samosas should rise to the surface and you need to turn them over every now and then so that they brown evenly. towel to soak up any excess oil. When they have finished cooking, gently take them out of the oil using a spaghetti spoon, drain them and place them on some dry, paper kitchen towel so as to soak up any excess oil. They are extremely tasty so remember, before you are tempted and bite into one, that they have just been in hot oil and need to cool down properly first. with a small pot of your favourite chutney. 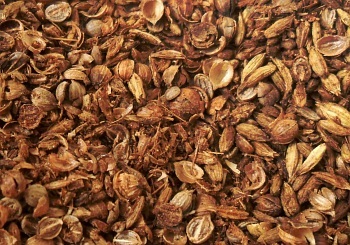 Add kalijeera instead of garam masala. Use red chillies or even red chilli powder instead of green chillies. Add a few drops of chilli oil to the fried potato mixture. 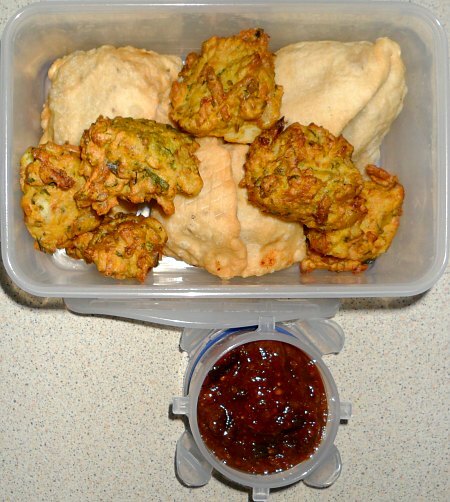 You can substitute everything if you understand their roles in the recipe - see English Samosas.